The Rendezvous Studio Hotel Brisbane on George will make sure that your stay is as comfortable as possible with a truly personal touch and boutique accommodation rooms. 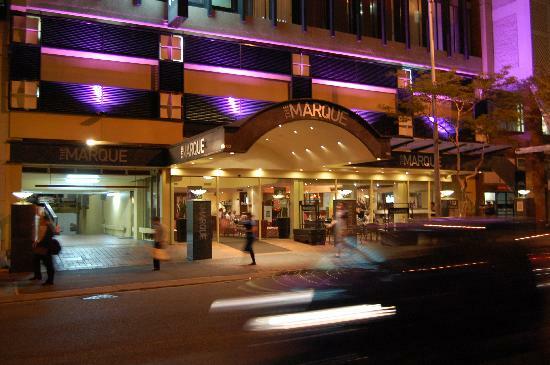 Located in the heart of the Brisbane city and adjacent to the Treasury Casino the Rendezvous Studio Hotel Brisbane on George is about more than just a place to sleep. A few minutes walk from the Rendezvous Studio Hotel Brisbane on George the Brisbane River & Southbank Entertainment precinct. This central city location makes the Rendezvous Studio Hotel Brisbane on George the ideal base from which to explore some of Brisbane's best attractions. With a wide range of hotel accommodation, combined with friendly service and a central location the Rendezvous Studio Hotel Brisbane on George is the perfect place to stay for both business and holiday travellers. This affordable property also has lots of great facilities including lounge bar, business centre, child minding, conference centre, currency exchange services, direct internet access, disabled facilities, faxing facilities, guest laundry, gymnasium, lift, restaurant, room service, outdoor swimming pool, 24 hour reception, baby cots available for families, babysitting service and daily housekeeping. The Rendezvous Studio Hotel Brisbane on George is ideally positioned just a stroll to Queen Street shopping precinct, riverside walks, Queensland University & Botanical Gardens. This affordable Brisbane hotel is also close by to the Queensland Art Gallery, Performing Arts Centre, the Brisbane Convention and Exhibition Centre and the South Bank Parklands. Deluxe Queen Room : Sleeps up to 3 guests on 1 Queen Bed & 1 Single Bed. Deluxe Queen/Twin Riverview : Sleeps up to 3 guests on 1 Queen Bed or 2 Single Beds & 1 Extra Single Bed. Deluxe Twin Hotel Room : Sleeps up to 2 guests on 2 Single Beds & 1 Single Bed. Executive Hotel Room Riverview : Sleeps up to 3 guests on 1 King Bed & 1 Single Bed. Executive King Suite : Sleeps up to 3 guests on 1 King Bed & 1 Single Bed. Spa King/Twin Room : Sleeps up to 3 guests on 1 King Bed or 2 Single Beds & 1 Extra Single Bed.